❒ Boyle’s law depends on the temperature of the system remaining constant. But suppose the temperature changes: How does a change in temperature affect the volume and pressure of a gas? ❒ Let us first look at the effect of temperature on the volume of a gas. The earliest investigators of this relationship were French scientists, Jacques Charles and Joseph Gay-Lussac. ❒ Studies of Jacques Charles and Joseph Gay-Lussac showed that, at constant pressure, the volume of a gas sample expands when heated and contracts when cooled. ❒ The quantitative relations involved in changes in gas temperature and volume turn out to be remarkably consistent. For example, we observe an interesting phenomenon when we study the temperature-volume relationship at various pressures. At any given pressure, the plot of volume versus temperature yields a straight line. By extending the line to zero volume, we find the intercept on the temperature axis to be -273.15oC. At any other pressure, we obtain a different straight line for the volume-temperature plot, but we get the same zero-volume temperature intercept at -273.15oC. 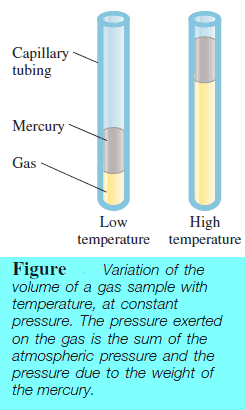 ❒The previous figure shows Variation of the volume of a gas sample with temperature, at constant pressure. Each line represents the variation at a certain pressure. The pressures increase from P1 to P4. 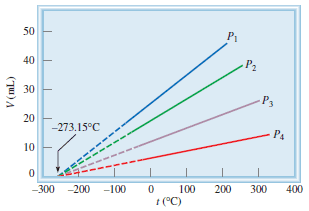 All gases ultimately condense (become liquids) if they are cooled to sufficiently low temperatures; the solid portions of the lines represent the temperature region above the condensation point. When these lines are extrapolated, or extended (the dashed portions), they all intersect at the point representing zero volume and a temperature of -273.15oC. ❒ In practice, we can measure the volume of a gas over only a limited temperature range, because all gases condense at low temperatures to form liquids. ❒ In 1848 Lord Kelvin realized the significance of this phenomenon. He identified -273.15oC as absolute zero, theoretically the lowest attainable temperature. Then he set up an absolute temperature scale, now called the Kelvin temperature scale, with absolute zero as the starting point. ❒ In most calculations we will use 273 instead of 273.15 as the term relating K and oC. 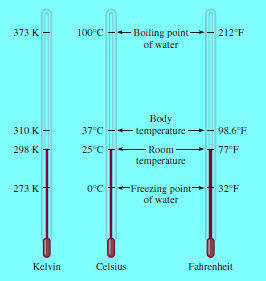 By convention, we use T to denote absolute (kelvin) temperature and t to indicate temperature on the Celsius scale.
" The volume of a fixed amount of gas maintained at constant pressure is directly proportional to the absolute temperature of the gas". where (k) is the proportionality constant. where V1 and V2 are the volumes of the gas at temperatures T1 and T2 (both in kelvins), respectively. 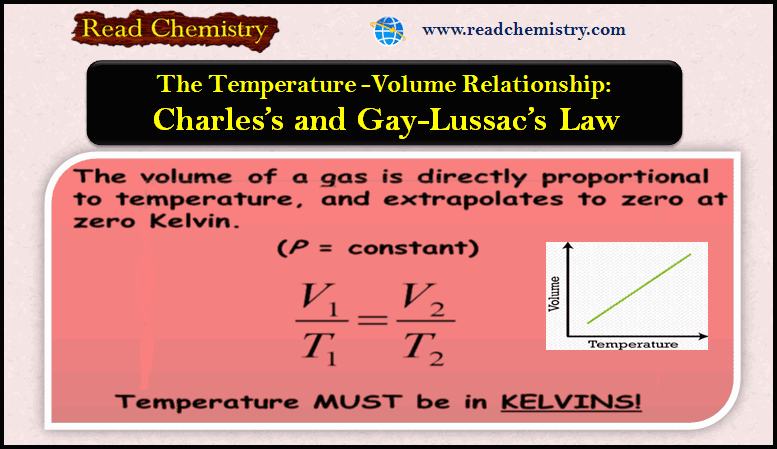 ❒ Another form of Charles’s law shows that at constant amount of gas and volume, the pressure of a gas is proportional to temperature. (b) that the Kelvin temperature is directly proportional to volume. (a) One obvious example: As the temperature is doubled the volume does not change. The volume is not directly proportional to Celsius temperature. (b) As the absolute temperature 273 K is increased to 373 K or 473 K, the volume increases to 373/273 = 1.37 or 473/273 = 1.73 times the original volume. The ratio of V to T is constant (see Table). The volume is directly proportional to absolute temperature. Example (3): Calculate the Celsius temperature to which a 678-mL sample of gas at 0 Co must be heated at constant pressure for the volume to change to 0.896 L.
Chemistry / Raymond Chang ,Williams College /(10th edition). Fundamentals of Chemistry / David E.Goldberg/(5th edition).